Today is the last day of our training and today we are told to write about what we learned and share our feelings about the training. I am Isha shrestha. I am very glad to participate in “Awareness raising and sexual reproductive health” training. I would like to thank Nepal Mahila Biswasi Sangh the YWCA of Nepal for providing me with this golden opportunity. Many women along with me who were not informed about women’s right and sexual and reproductive health have learnt many things in this training. On the very first day when I came to the training there was a discussion about women’s reproductive organs, at that time I was not feeling comfortable to talk about this topic. I didn’t even know about the meaning of many the words and the terminology being used. So I asked another trainee about the language and the meanings and she shared her knowledge with me. On the second day I later gained confidence to talk about these issues openly. After coming to this training I now understand that the YWCA helps those who don’t have self confidence and are deprived of their rights. Many women along, with me who took part in the training have gained self confidence and have learned many things including knowledge about our own bodies. 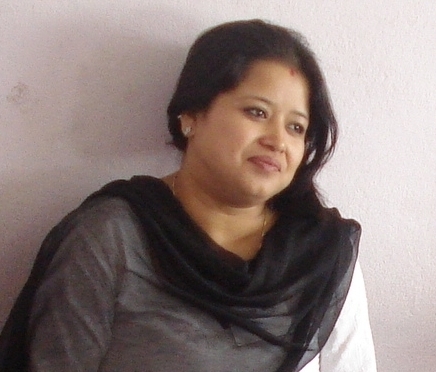 I would like to thank again to Nepal Mahila Biswasi Sangh the YWCA of Nepal. I want to continue to learn more!! Today is the last day of our training. I am Bibechana Bista. Today I am very happy to come to Kathmandu and I have been able to participate in these seven days Awareness Raising on Sexual Reproductive Health Rights, (SRHR) HIV/AIDS and Gender Based Violence (GBV) program of Nepal Mahila Biswasi Sangh the YWCA of Nepal. After coming here, I have developed confidence to return to my village and share my learning and knowledge on SRHR. In many rural areas women face multiple barriers and discrimination, of which violence against women is a major concern. I want to educate and help women get out of this situation and live healthy lives free from violence. Unfortunately, only males in our society are able to fully enjoy their rights and during the training we discussed this subject in depth highlighting the patriarchal state of the world at large. The training was a great achievement. Now, when going to my own working area as a journalist and radio broadcaster I will actively engage in the sensitization of women’s rights including sexual and reproductive health and rights, HIV and AIDS and gender based violence. I will fight to protect the rights of women and tackle discrimination against women as much as possible. I will always work to raise my voice about gender inequality.